As you may have seen if you visited our website, the registration for the Brussels Convention is opened. The event will take place at the Courtyard Marriott from Brussels, perfectly located between Brussels International Airport and downtown. The Courtyard is easily accessible by car, train (Jules Bordet station 500m) or bus (Permeke bus-stop 150m). The beautiful Courtyard Hotel offers the special EBCA rate of 75 € per room per night (including breakfast) for guests making their reservation prior to the 1st of November through the following link. Like every year, the Convention will feature a great mix of speakers from Europe and the US from the youth to the professional level in order for every coach to learn something he can use to improve the game on the old continent. Price for the Convention and the 2010 EBCA membership is 50 € The clinic will start Friday the 20th of November at 6.00PM to end Sunday the 22nd at 3.00PM. If you are making a reservation for more than 1 person, please let us know the above-mentioned information for them too. After sending that registration e-mail, you will receive an e-mail with all the payment details for the Convention. 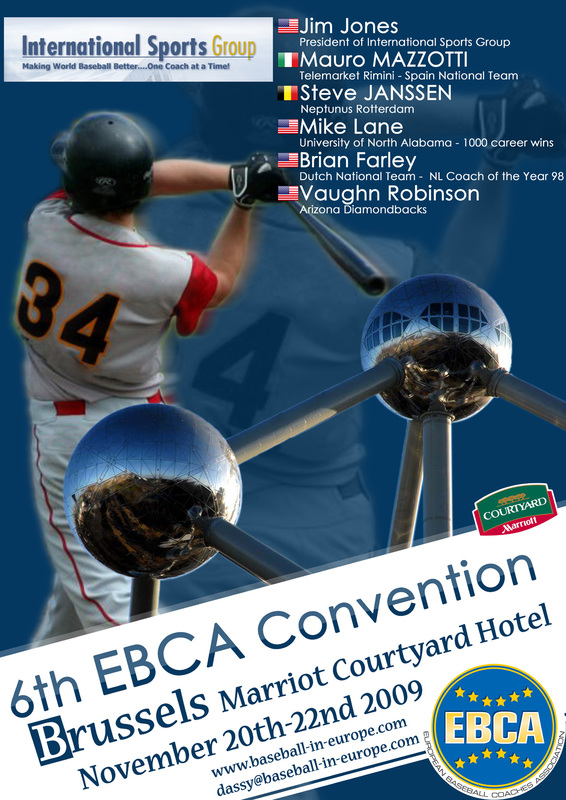 This year again, the EBCA, with the help of International Sports Group, is able to set up a great line-up of speakers that will include: Jim Jones, Mike Lane, Mauro Mazzotti. Steve Janssen, Brian Farley and Vaughn Robinson. More information on the speakers.